Just like cars anywhere else in the world, Japanese cars may have a genuine fault with the odometer which may require odometer repair through a manufacturer service center. In this case the odometer repair is noted in the service records and will be reported to auction by the seller since there are severe penalties in place for not doing so. Auction staff can include a * next to the kms on the auction report to denote unknown total kms, or a $ where records have been provided by the seller to confirm the total. It is in the seller’s best interest to provide records, since this will allow the best price to be obtained. For the latter case, the auction report will show the kms and date of the odometer repair or replacement, the current odometer reading as presented to auction, and the total kms traveled. 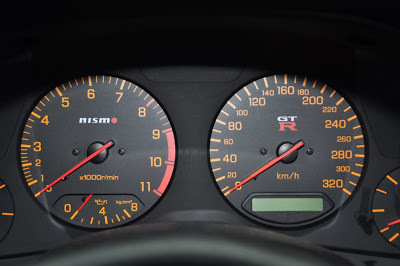 Aftermarket 300 km/h and 320 km/h speedos and instrument clusters from NISMO, Veilside, HKS and the like are often fitted to Japanese sports cars. Again this would be written on the auction report and noted as above depending on whether records confirming the total kms are provided. Starting in 2004, odometer (km) readings are recorded every time a passenger vehicle is inspected for registration renewal in Japan (3 years from new then every 2 years) and the last two such events are shown on the registration paperwork, so odometer tampering within Japan itself is rare.